You have dieted and exercised and there are still stubborn areas of fat that will not go away. Your reason for choosing liposuction may be as simple as just wanting to look better in your clothes. While liposuction is not a replacement for a healthy lifestyle, it can make you look and feel better. Liposuction is performed by Dr. Lowell Hughes for patients in our region to actually remove unwanted localized deposits of fat cells from the body. The procedure is meant for body contouring. It is not a treatment of obesity. A suction tube is inserted through a tiny incision placed in an inconspicuous location on the skin. With a high pressure vacuum, fat cells are extracted through this tube. The result is a resculpting of bulging areas into more attractive contours. What is the Tumescent Liposuction Technique? With the Tumescent Technique, large volumes of saline solution, local anesthesia, and adrenaline are infused into the fatty area being treated to cause swelling. This enables our physician to maneuver a small instrument called a cannula, connected to a vacuum machine, superficially under the skin. The cannula is inserted into the fatty tissue through tiny incisions. Your surgeon gently moves it around under your skin and suctions away the unwanted fatty deposits to reveal more attractive contours. have firm, elastic skin and are in good health. have tried to eliminate bulges through diet, exercise and weight loss. have distinct areas of localized fat that are disproportionate to the rest of their bodies. have realistic expectations and are only slightly to moderately overweight. understand that liposuction is not a substitute for weight loss. What areas can be treated by Liposuction? The most frequent areas treated by liposuction in men are the "love handles", breasts, abdomen and neckline. In women they include: thighs, hips, buttocks, stomach, knees, lower leg, cheeks, and double chins. Some women elect to have their fat recycled through lipo-augmentation. Cosmetically speaking, successful liposuction is measured in inches rather than pounds. The weight removed is not as important as the improvement in your body's contour. Most important is our patient's improved self-image and self acceptance. Is the fat removal from Liposuction permanent? Yes! It seems that after puberty we do not create new fat cells. When you gain weight, you expand the fat cells that you have. Should you gain weight after liposuction, it goes to the fat cells that remain in your body. The localized fatty deposits that existed prior to liposuction can no longer balloon up out of proportion to the surrounding areas. Will I need a second Liposuction procedure? procedure at a future date. 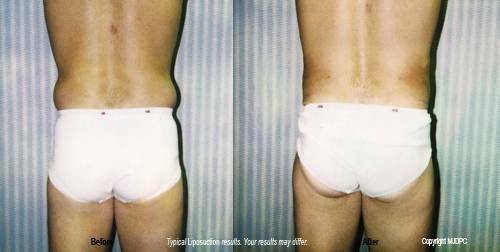 After Dr. Lowell Hughes performs liposuction, dimples, ripples and stretch marks remain unchanged. Your new figure will be similar to what you would expect if you could lose an equal amount of localized fat through diet and exercise alone. The use of smaller cannulas allows the fibrous connections between your skin and body to remain. These connections will contract over time. As a result, excessive skin folds are so rare that many patients avoid the necessity for surgical skin excision by having excellent results with liposuction alone. What will my recovery after Liposuction be like? You will go home after the procedure and rest for a few hours, after which you may gradually increase your activity as tolerated. After 2 - 5 days you may resume normal activities. You may need to wear a snug elastic dressing, girdle, or body stocking over the treated area to aid healing.